Succulents appeal to the lazy gardener because they tolerate neglect and drought due to their ability to store water in special tissues. Hens and chicks (Sempervivum spp.) appeal to the perennial gardener because they reproduce easily, providing new plants to expand the garden. Better yet, they are simple to propagate. Just wait until the babies put down roots, then sever the horizontal stems that connect parents to children. 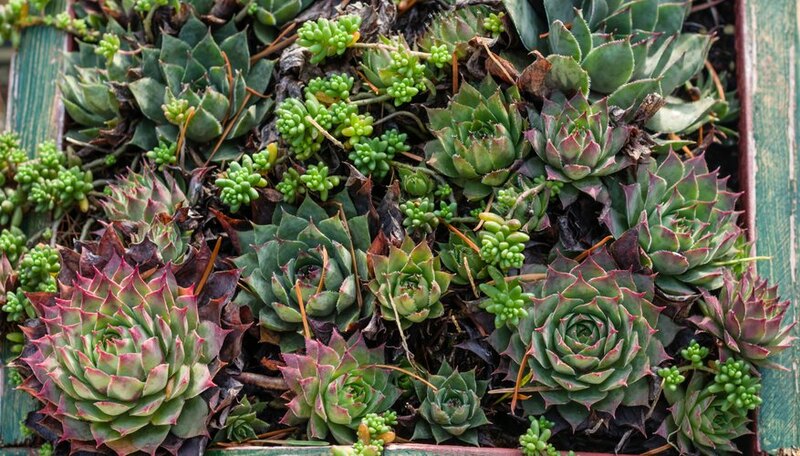 Hens and chicks, which grow in U.S. Department of Agriculture plant hardiness zones 3 through 8, do best in sandy, gritty soil, making them ideal candidates for the rock garden. They also adapt well to container growing -- try planting a family in a strawberry pot -- it can be moved indoors if you live outside of their hardiness range. As parent plants mature, they produce offsets, either around the base of the parent or out along thick stolons resembling ropes. As the hen's 6- to 15-inch-tall flower stalks fade in late summer, the hen has nothing left to give the baby chick and begins to die. At this time, the chick is actively putting down roots. Once the flower fades, water the soil deeply so soil clings to the young roots. Pinch or cut the connection as close to the chick as possible -- the wound will provide an opportunity for more root development. The plant roots are shallow, so pull offsets gently. Plant offsets where they have at least four hours of full sun daily. Plant the chick right away or put it in a tray or pot filled with cactus soil to keep until planting in a new area. Always use a container with at least one drainage hole. Remove the dying hen to make room for new offsets, severing stolons near remaining chicks as before. Fill the holes with fresh cactus soil or an equal mix of compost and sand. Add dead hens to the compost pile. Hens and chicks react to too much water with root and stem rot during most of the growing season, but after transplanting, water your plants to spur root growth. Always clean and dry cutting tools after use and wipe the blades with a mixture of equal parts water and rubbing alcohol. There are dozens of hen and chicks hybrids and cultivars to add interest to your plantings. Check with neighbors to trade offsets to vary your collection. Cultivars of common houseleek (Sempervivum tectorum) such as “Purple Beauty” (Sempervivum tectorum “Purple Beauty”) and “Twilight Blues” (Sempervivum tectorum “Twilight Blues”) have colorful highlights to match their names. Cultivars of cobweb houseleek (Sempervivium arachnoideum) often carry the hairy leaf margins of their ancestors. Little Giuseppis (Sempervivum x giuseppi ) are small and hairy with purple coloring. All grow in USDA zones 3 through 8.